meaningful threads: Who is not inspired by nature? Who is not inspired by nature? Nature has always been a deep source of inspiration for me. Last week, I turned to scrapbook of images I've collected over the years for use in color and sensibility inspiration. Not all, but many, many are nature shots. Colors. Textures. Lines. It's all there. L: Natural Dis-Tinction, Un-Natural Selection. Spring 2009 collection. R. Plato's Atlantis dress, 2010. So when I saw "The Force of Nature" theme of the current exhibit at The Museum at FIT, I knew I had to get there. The exhibit encompasses a nature-inspired fashion from a wide range of sources--from the more usual plants and animals to ocean life, microorganisms and weather. When I got home I found that I had three photos of fashion with feathers. All highly dramatic and certain to be the center of attention in any social setting. I love the colors and designs of feathers, but I don't need to use them other than as inspiration. I pick up interesting ones and pin them to my 'important' board above my desk. 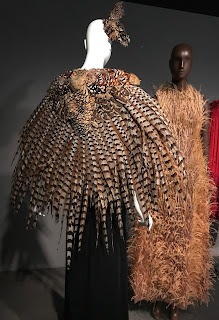 The two dresses (at right) by Alexander McQueen, known for his dramatic designs, can be best described in his own words: "I have always loved the mechanics of nature, and to a greater or lesser extent my work is always informed by that." The Museum at FIT is on Seventh Avenue at 27th Street in New York City and free to the public. This exhibit runs through Nov. 18, 2017. More information here. FIT's exhibit guide leads with da Vinci's quote, which is widely attributed to him and sounds like something he would have said. Although I have failed to find the source, I found other good quotes, which are highly appropriate and too good not to share. How marvelous to take a look of beautiful natural scenes? I often spend time with nature at dawn and sun set time.Your efforts are so genuine.I want to see some more posts by you.